The Internet grants every brand an opportunity to connect with the consumer masses instantly, making it a powerful weapon in any marketing arsenal. However, recent statistics revealed that, as of August 2017, there were over 1.24 billion websites in the world. 1.24 billion. With so many competing resources and websites, getting the online attention you deserve can prove challenging. Don’t merely include countless design “bells and whistles” that can dilute your site mission. Go into the process with a creative vision that has a purpose. Be sure the headers, fonts, layout, etc. conform to your vision and capture your brand’s identity on every page. For any images on your site, be sure you have legal permission to use them and that they’re compressed and appropriately sized for the web. Also look at spacing, colors, etc. for consistency and overall alignment with your brand. Search engine optimization plays a key role in your site success. SEO is essentially how your site is found during a search. No matter how amazing your frontend design is, if you forget to do the backend items that improve SEO, no one will see your new site. As you’re writing the content, pay attention to keywords and creating user-friendly content. Data plays a vital role in determining how well your site is doing compared to the competition. Install Google Analytics Google Webmaster tools. Not only with these resources give you insight into your visitors and how they’re interacting with your site, but they will also make you aware of any potential issues in virtual real-time. Telling the search engines about your site simply means creating a sitemap and submitting it to search engines like Google via their Webmaster tools. Although search engines may happen upon your site based on a keyword search, it’s far more likely your site will be higher in the rankings with a sitemap submitted. Websites are dynamic, evolving entities where things don’t always work as intended. Before you officially “go live,” check to be sure all links are working and lead where you intended them to go. People typically won’t wait more than a few seconds for your page to load, so be sure to check your website speed with either Google’s Page Speed Test or GTMetrix. Also, make mobile performance a priority. Smart devices continue to drive the number of consumers who are viewing sites on the go, making it critical for them to find you wherever they roam. Finally, if you have contact forms or e-commerce, check the functionality of those as well. Think about all the places your business is listed on the web, including social media. Updating existing listings to include your website or create new listings that include your site. These strategies help with backlinking for SEO and increase the chances of people finding you. 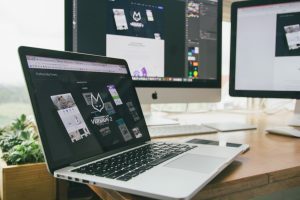 Need help launching a new site that does its job? Contact My Marketing Firm today to discuss your upcoming project with our digital marketing team.